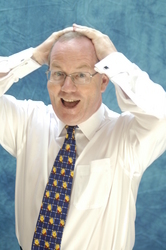 Cancer is not funny, but keynote speaker and business humorist Conor Cunneen has developed an inspirational, fun-packed keynote speech about his prostate cancer experience. It is probably only a Chicago-based Irishman who could develop a keynote titled “It’s Just a Flesh Wound” about the experience of prostate cancer. On his prostate cancer diagnosis, this inspirational speaker says, “There are a number of treatment options available ranging from radiation to prostatectomy, in other words the removal of the prostate,” he said in his light lyrical brogue. 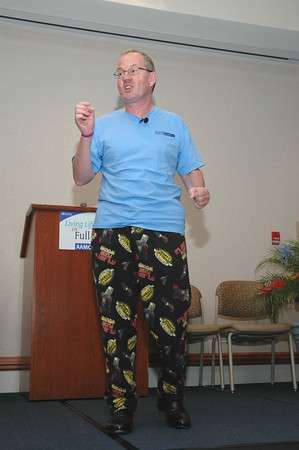 These are the actual Monty Python pajamas Inspirational dual cancer survivor Conor Cunneen purchased prior to surgery! Learn about Leprechauns DANCING on mushrooms from this inspirational humorous dual cancer survivor speaker!